When my friend first introduced me to Coconut Oil, I was a bit hesitant to even try it let alone go and buy it. She told me how good it was for your health and its benefits which includes a high amount of rich vitamins and minerals. She went on to tell me how she used it for beauty purposes and also a healing ointment for her baby's bottom and her dry lips. She went on to tell me how great it was for cooking and even as a substitute for a butter spread. By now she pretty much had convince me, and went on to doing a little research of my own. I found out the Coconut Oil was nicknamed "The Healthiest oil on Earth", I also found out the when you cook with coconut oil all the nutrients stay in the food, which is totally not the case with all the other oils. I started baking with this oils substituting all other oils, including olive oil which i usually used and my food tasted good Like real real good! My brownies were moist and tasted divine, with a slight kick of coconut flavor, but oh so Good! So I figure I share with you all the uses I have found for using coconut Oil! 1. Lip Balm, when my lips feel dry like extra dry, I will apply coconut oil to them and within a few applications not only do they feel moist, but I know the nutrients being absorbed by my lips are not hazardous but actually good for me. 2. As a lotion, I know you are probably thinking, Why in the world would I apply oil to my hands? Let me tell you that this oil is not only instantly absorb by my hands but there is no oil residue feel left behind. 3. Make up remover, You are not only avoiding putting harsh chemicals on your face, but it will get the job done and you will also have the great feeling of knowing that minerals that our faces need were actually left behind once the make up was removed. 4. Body Scrub, I don't know about you, but I love a good Body Scrub, and nothing better then if its something I can put together in my own house. I will usually put together equal amounts of coconut oil and sugar, mixed them together and I have a scrub full of nutrients and minerals that are being absorbed by my body while exfoliating my skin. 7. Acne, oil helping fight acne? those two don't seem to add up, but give it a try and it might just work for you. My skin is very acne prone and it has help keep it a bit under control I still brake out now and then, but not like I used to before applying coconut oil on a daily basis. 8. 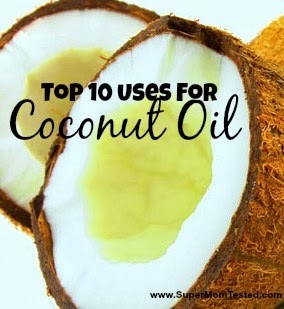 As a substitute for any oil when cooking, as I had mention before Coconut oil is known as the "Healthiest Oil on Earth", Not only is it packed with nutrients and minerals that stay in our food when cooking, even after high levels of heat. It also contains Lauric Acid which is proven to be anti-fungul, anti-bacterial and anti-viral agent. 9. As a shaving Cream, OK so I had read about this and since I had already being doing a scrub, I figured why not! So yes it totally works and it leaves your legs moisturize. 10. For Baking, I dare you to try it! Substitute any call for oil on any recipe and tell me if whatever you bake, does not taste oh so Good! You will also be able to tell that your cookies, brownies, bread will be so moist and to top it off a ton healthier! Coconut Oil is the most saturated of all fats including butter even though it is plant based. I would not put it in your diet on a daily basis though I do agree on it's yummy taste in baked goods. Yes it has all those nutrients that we want in our diet but we don't want saturated fats that lead to health problems. I would recommend getting those nutrients somewhere else. I think the rule with everything is moderation, I do cook with it! but I try to only bake with it maybe once a week. Thank you for stopping by our blog!! !